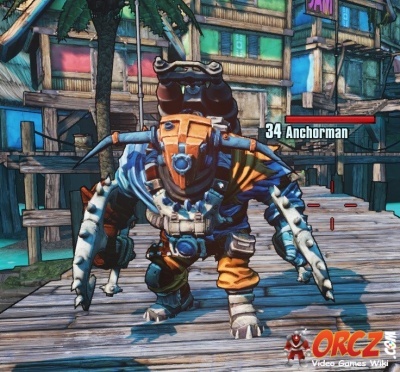 Anchorman in Sir Hammerlock vs. The Son of Crawmerax. This massive foes wield 2 anchors. These can be used to either bash foes away or pull them toward the Anchorman. They have fair range but are not too quick. They can be deadly if a mob is around them and you are pulled in unprepared. This page was last modified on 5 June 2014, at 19:26. Content is available under Creative Commons Attribution Non-Commercial Share Alike unless otherwise noted.